I have to say, I was a little disappointed by the June bag. But having looked at all of the possible things I could have received this month, there wasn’t really anything that was particularly interesting (though there were some things I would have preferred over another eyeliner). With these types of things you are bound to get a dud every so often, so for now I’ll remain subscribed and see what happens. 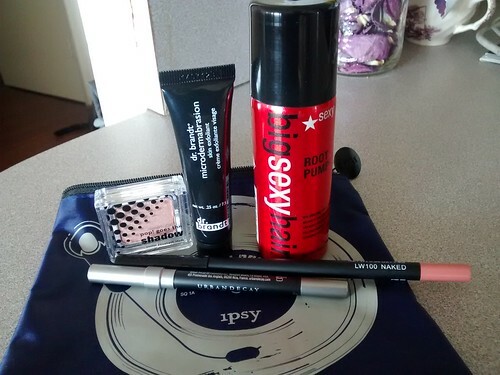 My second Ipsy bag arrived and came with some fun stuff! The theme was fresh picks, and the very first thing I used was the bag itself, which is a perfect size for all the various small things I like to carry around at conferences (tiny toothbrush, hand lotion, bandaids, nail file, hand sanitizer, etc). 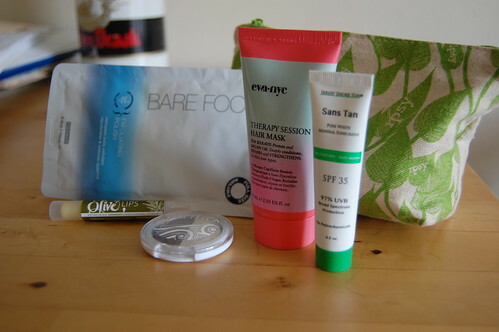 My cautiously increasing interest in makeup, combined with the fun of the tasting boxes I’ve been doing, led me to start exploring beauty boxes. Birchbox is the big name that most people know, but from what I’ve seen they tend to mostly do skincare, and some friends who’ve tried it agreed. That doesn’t particularly interest me. Then I noticed a couple of friends posting on Twitter about their Ipsy Glam Bags. I recognized a lot of the brand names they work with – including some I use – so I subscribed. After signing up I also heard about Beauty Army, which lets you pick what you get each month, and Julep, which is focused on nail polish. I’ll probably try both of these at some point in the future. Particularly Julep, I like doing pedicures. As you may know if you know me IRL, I took a new job this summer and am now working for the American Psychological Association — I’m a training specialist for all research databases we publish. But this post isn’t really about that – it’s about transitioning into an environment that’s a bit more professional, sartorially speaking, than the library I left. My attempts to start cutting chemicals out of my life this year have naturally spilled over from household cleaning products into my personal care products. Today I want to highlight a couple of changes I’ve made to my routine so far. First off, one of the easiest things I did was stop using body wash and start using all-natural bar soap. This cuts down on plastic that needs to be recycled, and also on chemicals. At the moment I am using Pure & Natural soap. It’s free of a lot of chemicals, and uses mostly natural ingredients. And, the packaging for the soap so biodegradable that it includes seeds and tells you to stick it in some dirt and water it. This soap has been working out just fine for me. I picked it up at Target with a couple of coupons, and I think it was on sale that day, too. They have several different fragrances, but I barely notice the smell. (I think I have the cherry & almond at the moment). Now, on to the slightly bigger steps. For as long as I can remember, I have washed my hair every day. This is not what hairdressers recommend, as it strips away the natural oils that keep your hair healthy and shiny. However, for those of us blessed with overactive oil production, things get a little gross. I used a lot of Herbal Essences, primarily because it frequently goes on sale and there are often coupons for those products. Imagine my surprise earlier this year when my hairdresser commented that my hair was dry and recommended some essential oils to condition it. What?! I have also washed my face twice a day, every day, another supposedly drying practice. Mostly I have used Oil of Olay products, but at various times I’ve used products from the Body Shop and Kiehl’s. As someone with very bad skin as a teenager, this was something I did without a second thought. And for a long time, if I slept in makeup I could be guaranteed to break out at least a little bit. As I’ve gotten older, that has stopped to be the case (thank heaven), but I still stuck to the routine and only infrequently skipped washing my face. Today on the low-maintenance woman, we’re going to discuss the utterly obvious: Cleaning of makeup brushes. Today on the low-maintenance woman, we’re talking about undereye circles. And we’re talking about them from the perspective of someone who is practically see-through, and thus has them basically all the time. It doesn’t matter how well-rested I am, they’re never fully gone. When I’m tired or not feeling well, they’re really bad. A couple of years ago, I went makeup shopping with Abby, my personal stylist. This was mainly because I was going to be a bridesmaid in my friend Jill’s wedding, and didn’t want to look like an idiot. One of the things I purchased that day was a tube of Pixi Undercover concealer. This stuff is fantastic, and believe it or not I am still using the same one now, and there’s still some left. (Yes, I know by the Laws of Makeup I should have tossed it long ago because there is probably some bacteria growing in it, but you know what? It’s bacteria that got on there because it was on my face to begin with, so I’m OK with it.) Until recently, they only sold in the US through Sephora, and not every Sephora seemed to carry them (as I was very snootily informed when I inquired at one in Philadelphia), and Sephora’s online store didn’t carry it either. Now they have a US website, and they are also selling some part or spinoff of their line at Target. Yay and yay! Anyway, I use that almost every day (sometimes even on days when I’m not planning to put on any other makeup). It really does make a difference, which continues to surprise me. In theory this is supposed to reduce dark circles and puffiness. I’ve been using it twice a day since I got it in August, and to that claim I say “bah!” I have seen zero difference. The cream itself is a little sparkly, which might help refract some light away from the dark circles, but I see no noticeable difference. So I’ll use this up, but I won’t bother trying anything else, at least not for the next decade or so.